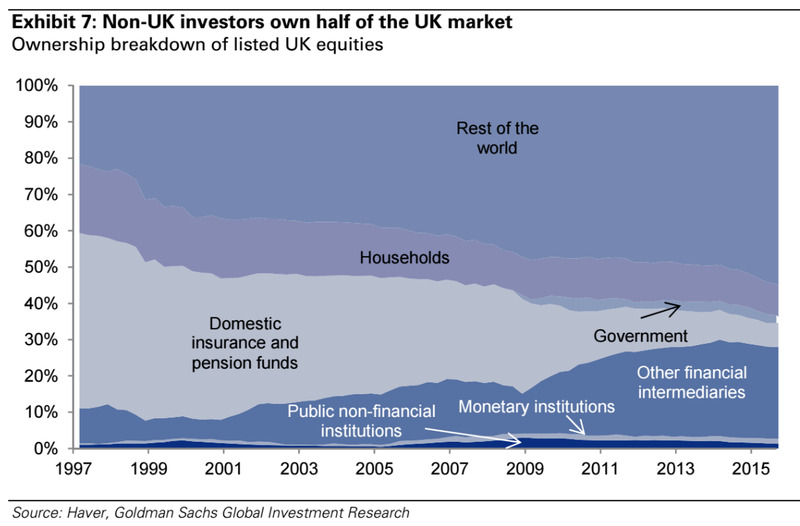 Unsurprisingly, about half the market is owned by people who live outside the UK. Only a tiny sliver is owned by households or the government, the only two sectors that have a long-term vested interest in the fate of the UK as a place to live. Of course, there is a difference between the risk of a UK exit from the EU and this actually occurring, and it’s possible the FTSE 100 stocks would move to a discount vs Europe as investors apply a higher risk premium to UK assets. 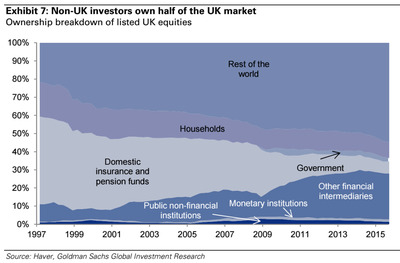 As shown [in the chart] around 50% of UK equities are owned by investors outside the UK. But we cannot be certain about this. Despite all the turbulence around the UK leaving ERM in 1992, we did not see a clear discount for UK stocks. And the FTSE 100 and FTSE 250 outperformed vs Europe strongly afterwards.